On February 11, 2018, Michael Rothschild was skiing at Beaver Creek. It was his last run of the day, and he admitted he was a bit tired. The 66-year-old fell, as many skiers do on their last runs, which Rothschild initially described as “a normal fall.” But he soon learned that this fall was very out of the ordinary. To this day, he still has no idea why it led to a complex pelvic fracture. Watch Denver Health patient Michael Rothschild explain how Denver Health saved his life. After his fall, an ambulance rushed the Boulder resident to Denver Health, where he had surgery two days later. Cyril Mauffrey, M.D., Denver Health’s director of Orthopedic Trauma and Research, said Rothschild broke his acetabulum, known commonly as the hip socket. It was broken into multiple pieces and required Dr. Mauffrey to use a metal plate to repair it. Rothschild, the founder and chairman of Profit Velocity Solutions, was determined to recover, for his family and his business. He credits the care he received from Denver Health and Dr. Mauffrey for getting him active again. 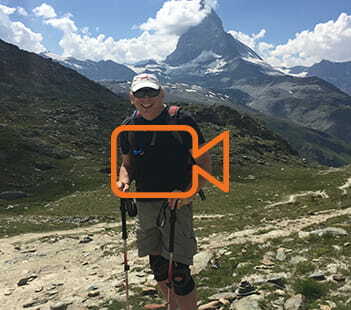 Exactly 22 weeks after his injury, Rothschild sent a picture to Dr. Mauffrey from Zermatt, Switzerland, where he had just completed an eight-mile hike through the Swiss Alps. Just prior to that hike, he was able to dance with his daughter at a wedding. Michael Rothschild said Denver Health director of Orthopedic Trauma and Research Cyril Mauffrey, M.D. saved his life after a skiing accident. “I was determined to do it,” Rothschild said while choking back tears. He plans to get back on the slopes and go skiing again this winter.